Henry James was born in New York City in 1843. 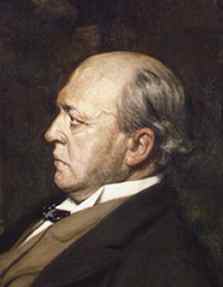 His father, Henry James Sr, was a wealthy man and a well-known intellectual, whose friends included Thoreau, Emerson and Hawthorne. The affluence the family inherited from his Irish grandfather allowed James to live in comfort; he never made much money from his writing. As a young man, James traveled between Europe and America, and studied law at Harvard briefly at the age of nineteen. He published his first short story, A Tragedy of Errors, two years later, and began writing full-time. His first novel, Watch and Ward (1871), was written on a voyage through Venice and Paris. During his years in Europe James wrote several novels portraying Americans living abroad. Between 1906 and 1910 James revised many of his tales and novels for the New York edition of his complete works. Before his death in 1916, he also completed his autobiography, which included A Small Boy and Others (1913), Notes of a Son Aand Brother (1914) and The Middle Years, which was published posthumously. The novels of Henry James are remarkable for their understanding and sensitively drawn female characters. His main themes were the innocence of the New World in conflict with corruption and wisdom of the Old. Among his masterpieces are Daisy Miller (1879), The Portrait of a Lady (1881), The Bostonians (1886), The Wings of The Dove (1902), and The Ambassadors (1903). James's most famous short stories include The Turn of the Screw, a ghost story in which the question of childhood corruption obsesses a governess. Christopher Newman, an American man, arrives in Paris and falls in love with Claire de Centre, a young widow. Details his struggle to free Claire from the tight grip of her mother, Madame de Bellegarde. A man's struggle to obtain a collection of letters by an American poet. A satiric short story, told in the form of letters, about a series of mishaps that occur to people living in a Parisian boarding house. Daisy Miller is an American woman traveling in Europe with her mother. After being in a compromising friendship with an Italian man, she is shunned by society. The tale of a haunted house, "The Jolly Corner," which allows a man to see what might have been. Count Otto Vogelstein meets Pandora Day on a trip from Southampton. The story of a young, naïve woman who goes to work as a governess in what appears to be a haunted house.